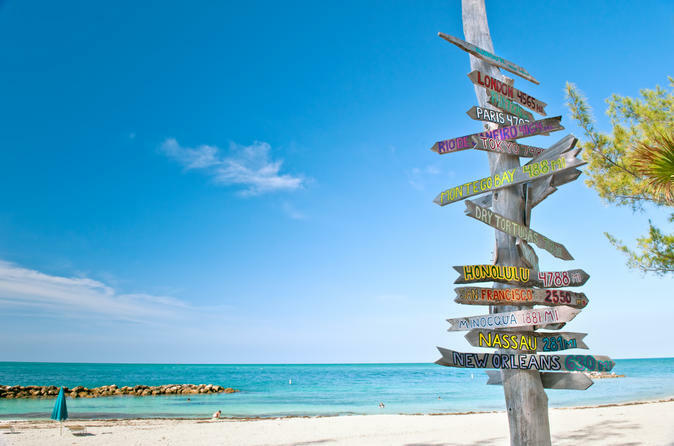 No visit to South Florida is complete without a journey to Key West! There are plenty of ways to enjoy your time on this culturally and history-rich island. You can take it slow with a leisurely day soaking up Key West's laid-back atmosphere, quaint shops and outdoor cafés or if you are looking for more activity, there are upgrades available. Get out on the water on a glass-bottom boat ride, snorkeling cruise or parasailing adventure, or see the attractions on dry land on the Hop-on Hop-off Trolley Tour or with a ride on the Conch Train. The 12-hour day trip from Miami to Key West is a mesmerizing trip not to be missed. On your way to Key West you'll cross 42 bridges, including the famous Seven Mile Bridge, whose film credits include True Lies, 2 Fast 2 Furious, the James Bond film Licence to Kill, CrissCross and Up Close & Personal. You will also hop 32 islands before reaching Key West to experience its Caribbean atmosphere, complete with street artists, outdoor cafes and restaurants. During your visit be sure to check out the Hemingway House and Mallory Square by the historic waterfront. Lunch is not included but there are plenty of restaurants to choose from in Key West during your trip. Approximate free time in Key West is from 12pm to 6pm. Upgrade and combine your Key West visit with a glass bottom boat ride, a hop-on hop-off tour, a Conch Train ride, a snorkeling cruise or parasailing to your Key West trip. Discover the 3rd largest reef in the world on this Key West Glass-Bottom Boat ride. The reef is home to a variety of plants and animals. Enjoy a fully narrated guided hop-on hop-off, Trolley Tour of Key West! The trolley makes stops at all the must-see places in Key West. You can jump off, visit the sights and re-board all day long. Perfect for first time visitors, the fully narrated Conch Train Tour of Key West is a fun way to explore and learn about the island. Climb aboard and see the sights as the quaint open-air train winds through Old Town Key West. Take 3-hour snorkeling cruise in a 65-foot catamaran to the coral reef for a chance to discover a whole new world underwater. You can even snorkel this reef year round because of its warm and tropical waters. Snorkel gear and alcoholic and non-alcoholic beverages on the catamaran are included. Soar above the emerald blue waters of Key West while enjoying breathtaking bird's eye views of this island paradise. Float on a tropical breeze as one of our state-of-the-art, parasailing boats of 12 passengers glides you past amazing panoramic sights of the southernmost city that can only be seen from the air. Minimum age: 6 years old. Special Offer - Book and save 33% compared to the local supplier's day trip prices! - Book Now!